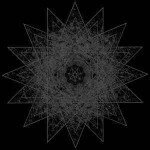 Background/Info: Grant Richardson is active under the Gnawed moniker for a couple of years now and has released an impressive number of records on multiple labels like Spit And Cuss, Maniacal Hatred, Phage Tapes ao. He now returned to Tumor/Malignant Records to unleash his latest sonic bomb. 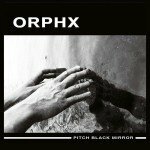 Content: The debut of the album reveals a mix of dark-ambient atmospheres and heavy industrial treatments, which are rapidly joined by industrial percussions. Dark, buzzing noises hang over the work while drones, metallic noises and hard, screaming vocals progressively emerge at the surface. “Pestilence Beholden” has been meticulously constructed like a spider web and the more you move throughout this world of sonic terror the more you’ll get the feeling of being imprisoned in a torture room with sharp noises. + + + : This album sounds heavy, but it all feels like the author never lost control and never falls in the trap of pure improvisation. The tracks have been meticulously built up towards a final point, which is accentuated by hard assaults of metallic noises, scratches, tormenting atmospheres and enraged screams. The work reveals a few jewels of death-industrial music. 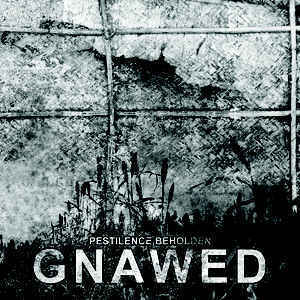 – – – : Gnawed remains an extreme composition, which you better avoid if you’re not familiar with this kind of music. This album is more styled and maybe ‘controlled’ than previous releases, which will maybe not please all fans of the band. Conclusion: Gnawed is a dangerous sonic terrorist, which takes no break and has no mercy. The music will take you by surprise and leave you in shock, but the good thing is… you’re going to like it! Best songs: “Who Shall Reap?”, “Serpent In The River Of The Arms Of God”, “The River Runs Dry”, “Perdition – Death’s Disease”.